Also, for as poor as Simmons was offensively in Game 1, he did an outstanding job on D'Angelo Russell, holding him to 10 of 25 from the field. Game 2 wasn't much kinder to Russell, who finished just 6 of 16. 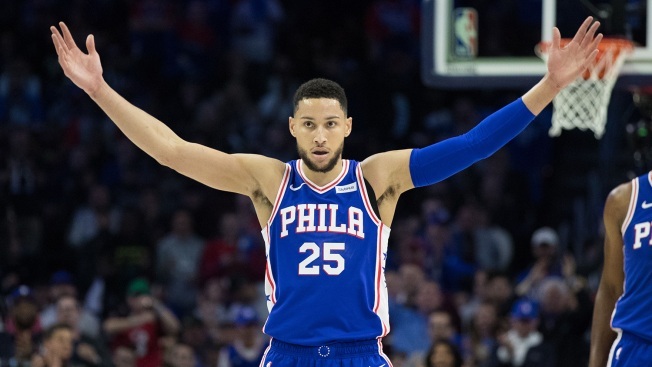 Simmons has flashed elite defensive ability at times this season and has been stellar through two games in the playoffs. • Embiid was a little slow to get going. He didn't attempt a field goal in his first seven minutes of action. It's funny, Embiid seemed quiet in his 12 first-half minutes, but had 10 points and five boards. Even with an achy knee, he can shows signs of sheer brilliance. He moved around much better Monday night than he did Saturday afternoon. Redick has been in these situations before. While his playoff play has been up and down in his career, you know he's a veteran and he ended the regular season on an absolute tear. He finished with 17 points on 7 of 12 from the field and 2 of 5 from three. He adjusted to the Nets overplaying him at the three-point line by taking - and making - more long twos. With James Ennis back in the lineup, Brown didn't bring T.J. McConnell or Jonathon Simmons off the bench until garbage time. The move paid dividends immediately. Ennis played better defense on Caris LeVert on his first defensive possession than any Sixer did in Game 1. I wasn't sure the impact Ennis would have in this series, but he gave the Sixers a real boost in 12 minutes Monday. And speaking of the bench, how good has Boban Marjanovic been during the first two games of the series? Maranjovic had 14 points in 11 first-half minutes and ended up with 16 points and eight boards. He's also held up OK on defense. Getting solid backup center minutes from him will be huge for the Sixers. Mike Scott also had a bounce-back performance, hitting 3 of 5 for 15 points.